Is There Hope for the Chicago Police Department? Yes, but only if we abandon the failed menu of governmental responses to policing scandals. Here’s what we should do. For a long time, Chicago officials have been writing checks—big checks—to families of people victimized by city cops. According to the nonpartisan, nonprofit Better Government Association, the City of Chicago shelled out over half a billion dollars between 2004 and 2014 for acts of police misconduct: false arrests, perjury, wrongful convictions, racial bigotry and discrimination, reckless vehicle pursuits, excessive force, torture, and unjustified killings. That figure does not reflect a staggering 500 additional claims in the pipeline. Nor does it include a 2015 settlement stemming from the October 20, 2014, shooting death of 17-year-old Laquan McDonald. The incident, captured on a police vehicle’s dashcam, is remarkable for the shocking disregard of human life exhibited by Officer Jason Van Dyke (currently facing first-degree murder charges). But it is also notable for another reason. The boy’s death set in motion a time-honored response from Van Dyke’s fellow cops, their union reps, and, indeed, their bosses at headquarters and City Hall. That history includes the 1968 Democratic National Convention, where Connecticut Senator Abraham Ribicoff criticized, from the rostrum of the International Amphitheatre, the “Gestapo tactics” of Chicago’s finest. An enraged Mayor Richard J. Daley, heard by some to shout anti-Semitic profanities from the floor, vigorously defended his cops and, when the tear gas cleared, rewarded them with a raise. His son, Mayor Richard M. Daley, ignored overwhelming evidence of the 1972–91 reign of terror by Detective Commander Jon Burge and his posse of renegades who tortured as many as 200 African-American men, coercing confessions, manufacturing evidence, and costing the city $5.5 million in reparations to the victims. Which brings us to the incumbent mayor. Even in the face of the video confirming the murder of McDonald, Emanuel kept Officer Jason Van Dyke on the city’s payroll for over a year. Chicago’s leaders have habitually brushed aside incontrovertible evidence of institutionalized police wrongdoing. One of the most troubling findings of the task force is the breadth and depth of bigotry—and the racism is structural. One of the most troubling findings of the task force is the breadth and depth of bigotry within the ranks, including widespread use of racial and ethnic slurs. Prosecutors and judges are part of the problem; according to one former court clerk in the Cook County prosecutor’s office, they commonly mocked “black-sounding” names and used “bastardized Ebonics” to ridicule defendants, families, and victims. The racism is also structural, of course. 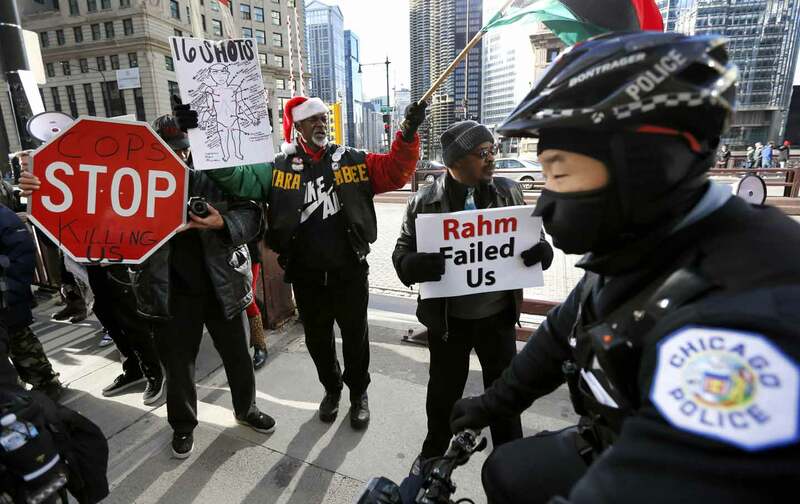 Constituting roughly a third of the city’s population, Chicago’s black citizens are stopped and frisked at wildly disproportionate rates (72 percent of all street stops), even as whites are more likely than blacks and Hispanics to be caught with contraband. According to one ACLU study, Chicago police are far more likely to search black and Hispanic motorists, and yet were far more likely to find contraband when searching white motorists. Fully 76 percent of citizens on the receiving end of Taser shocks are black. Most alarming, of 404 police shootings between 2008 and 2015, 74 percent of those shot were black. We need “demilitarization” and a complete overhaul of American law enforcement. To regain, or establish, that trust, the group offers recommendations similar to those generated by President Obama’s own “Task Force on 21st Century Policing,” formed in the aftermath of the police shooting death of Michael Brown in Ferguson, Missouri. The two groups’ recommendations—stronger citizen oversight; more thorough, accurate, and timely internal investigations; more and better training, especially in conflict-management skills and de-escalation techniques; body cameras for patrol officers; and, generally, closer supervision, better accountability, greater “transparency”—make perfect sense, and should be implemented as soon as possible. However, these two task forces—and every other “blue ribbon” police inquiry panel since the Wickersham Commission report of 1931—have fallen grievously short of what’s needed: the structural “demilitarization” and complete overhaul of American law enforcement. It’s complicated, naturally. But three steps are essential. First, this nation must end the drug war. More than any other public policy, the War on Drugs has made enemies of cops and citizens (disproportionately young, poor, and of color). It has corrupted countless police officers and law-enforcement agencies. It has done irreparable harm to individuals, families, and neighborhoods. Further, despite having spent, by one commonly cited estimate, close to $1.5 trillion prosecuting and incarcerating tens of millions of people (many sick or mentally ill, and in need of treatment, not jail) between 1970 and 2010, illicit drugs are more readily available, at lower prices, and higher levels of potency than when President Nixon famously declared this war on the American people. Second, using the tens of billions of dollars saved by ending the drug war—with a portion of the savings earmarked for a strong regulatory system, as well as drug-abuse education and treatment—the Justice Department should be tasked with setting and enforcing national standards for every branch of American law enforcement: federal, state, and local. Congress should expand DOJ’s current investigative duties to include formulation of reasonable, defensible standards of performance and conduct for every cop in the country. Each officer, each agency, must achieve certification in all aspects of procedural justice: search and seizure; stop-and-frisk; laws of arrest; rules of evidence; use of force, including lethal force; and First Amendment protections. The Justice Department must also be empowered to decertify, for cause, individual officers and individual agencies. And, third, based on the constitutional premise that the police belong to the people and not the other way around, an aroused and organized citizenry (including representatives of such organizations as Black Lives Matter as well as sympathetic police officers and politicians) should demand full citizen participation in all aspects of police operations: hiring, policy-making, program development, training, crisis management, and citizen oversight. In only exigent, dangerous situations should police officers make unilateral decisions—in conformity with policies set by the citizen-police partnership. Regrettably, in exposés of police misconduct we tend to rely on a failed menu of governmental responses: sack the mayor, or try to; swap out police chiefs; rail against police unions; form a committee; and implement a few, mostly cosmetic, broadly palatable changes… while ignoring the hard, bottom-up work needed to bring about authentic and accountable community-based policing. I believe Rahm Emanuel when he says, as he did recently in announcing adoption of about a third of his task force’s recommendations, “As a city, we cannot rest until we fully address the systemic issues facing the Chicago Police Department.” He’s right about that. But if true organizational reform comes about, it will be because the federal government and the citizens of his city made it happen. Norm StamperNorm Stamper was a police officer for 34 years, the first 28 in San Diego, the last six (1994-2000) as Seattle's police chief. He is the author of Breaking Rank: A Top Cop’s Exposé of the Dark Side of American Policing (2015) and, to be published in June, To Protect and Serve: How to Fix America's Police (both by Nation Books).